Not only will it be cheaper but it will be oozing with love. Because let's face it, a bottle of Bacon is loooooove! This sticky, sweet and savory spread is bottled with a kick thanks to my favorite condiment, Sriracha. I literally threw my favorite things into a pot and bottled it: bacon, roasted garlic, caramelized onions and Sriracha! You or your lucky friends can enjoy this with plain toast, on top of any kind of cheese, grilled meat, smear them on your burgers or lick them straight from the spoon (I won't tell!). The possibilities are endless! Note: I added a touch of color and whimsy by tying a cute ceramic tag with colored baker's twine due to the jam's lackluster color. 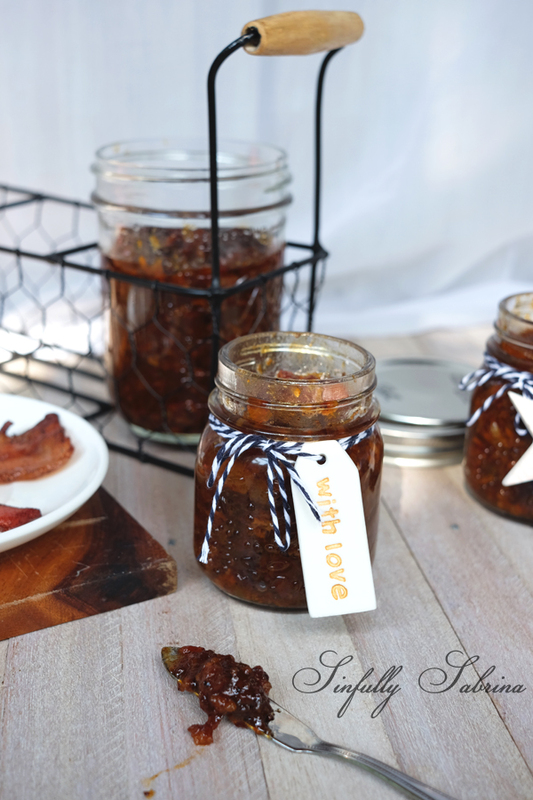 However, that doesn't take away from the fact that this Bacon Sriracha Jam is to die for! 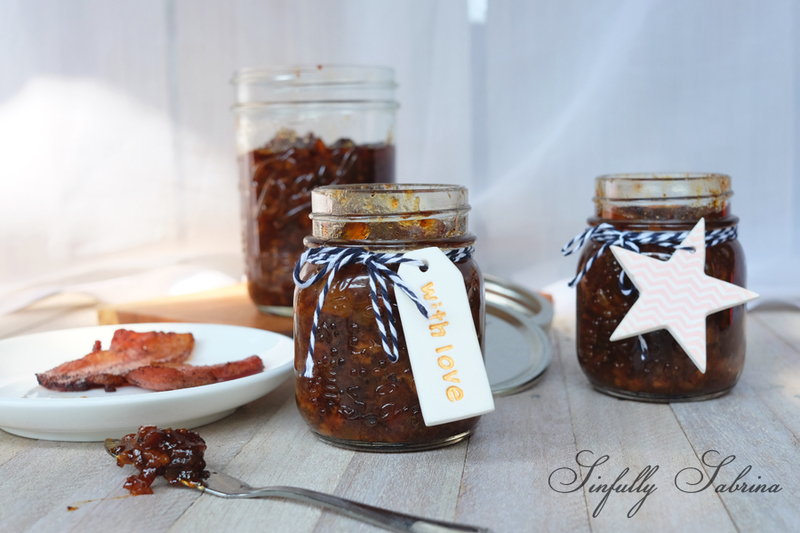 Have fun with this unique bacon jam recipe! And as I always say, feel free to add in any herbs or spices you like and customize it to your taste! Enjoy! In a large skillet, cook bacon over medium-high, stirring occasionally, until fat is rendered and bacon is lightly browned, about 20 minutes. With a slotted spoon, transfer bacon to paper towels to drain. Pour off all but 1 tablespoon fat from skillet (reserve for another use); add onions and garlic, and cook until onions are translucent, about 6 minutes. Add vinegar, brown sugar, sriracha, light corn syrup, chicken stock and bring to a boil, stirring and scraping up browned bits from skillet with a wooden spoon, about 2 minutes. Add bacon and stir to combine.